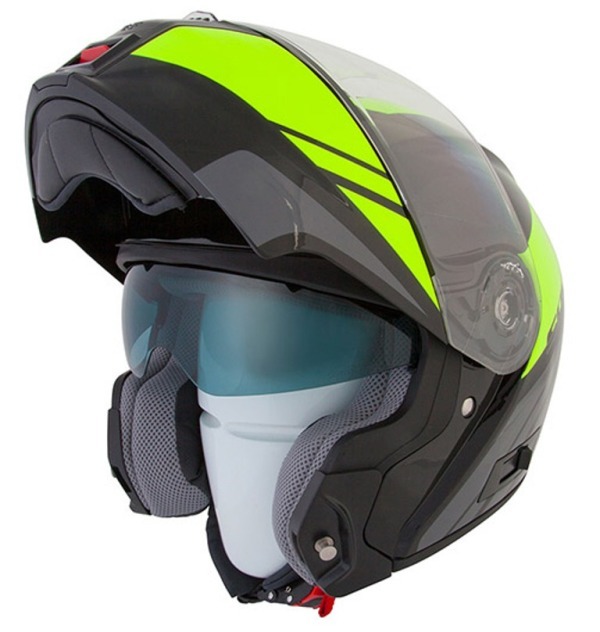 The Spada Cyclone helmet is perfect for the daily commuter or the long-haul tourer, and ease of use is of prime importance when designing this lid - this is recognised by the ergonomic external mechanism levers throughout, for both the flip front system and drop down sun visor, that remain easy to use when wearing gloves too. The Cyclone also boasts fully removable and washable cheek and centre pads to keep things fresh inside, as well as front lower and upper ventilation to keep things cool. It is especially useful if you want to take the race ready ACU approved Cyclone on track! Available in both plain colours and striking linear graphics, the Cyclone is the ultimate all season helmet, offering exceptional ventilation and comfort.